It’s important to find the best video camera for kids because you want your children to enjoy it and get plenty of use out of it. Want to go straight to our reviews of video cameras for children and teenagers?You will find the “categories” list in the menu (right hand side on desktop browsers, top of the page on mobile browsers).Just use the link to visit the section you want! A kids video recorder or camcorder is lots of fun, but it can also be educational. Kids are able to learn and develop a wide range of skills, including concentration and memory skills. Making their own home movies also encourages youngsters to be creative and can improve their social skills. 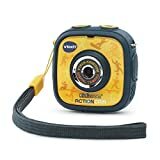 If your child is 4 or younger, you might want to wait a while before investing in a camcorder (for pre-schoolers, there are loads of kids digital cameras that also have a video function). Most children are capable of working a basic camcorder from around 5 years old. Little hands won’t find it easy to hold and operate a big, heavy video camera. For young children, look for a model that is easy to grip and looks durable enough to withstand the occasional bump or drop! While you want a good quality camera, simplicity is key. Buttons and controls should be large and self-explanatory. Forget about sophisticated settings and lots of manual controls. It will just be far too confusing for your child, and make them want to give up. Decide whether you want a digital video camera for kids (i.e. basically an interactive toy) or an adults’ version that is basic enough for a child to use unsupervised. If you go for the first option, don’t expect high resolution footage, optical zoom or any other more advanced features. This isn’t a bad thing, because kids won’t know what they don’t have! The point is to buy a model that they are going to get the hang of quickly, and love using. If you go for the second option, you are likely to have higher resolution and a couple of more sophisticated features, and accordingly it is likely to be the more expensive choice. A great bonus of having a camcorder is being able to watch the footage on a bigger screen, so make sure your chosen model can be hooked up to a television, and you can look forward to family movie nights! Look for a minimum of 32MB built-in memory, and an SD card expansion slot that will let you increase the storage by 1GB or more. If you can’t film for very long before you have to start downloading, it spoils the fun! If you go for the most basic model, it will perform far better outdoors than in. Again, this comes down to budget. Spend a little more and you can get a model with a light to improve indoor filming. Consider how much time you spend outdoors with your kids before deciding how important this factor is. Invest in good quality rechargeable batteries! You are going to be drinking a lot of battery juice, so rechargeable batteries (while initially more expensive than regular AA batteries) will prove far more cost-effective in the long run. What sort of screen does the camcorder have? They will all have an LCD screen, but you may want one with a flip out screen as it makes viewing easier. If you are investing in a camcorder for a teenager, you are unlikely to be able to persuade them to use a kids’ model! They won’t be seen dead with anything that looks in any way like a toy. The good news is that there are lots of affordable video cameras that are definitely not toys, but great options for a teen. These models are easy to use, very portable and won’t be way out of your budget. Make sure it is easy to upload the footage to social networking sites – teenagers spend a lot of time there! The camera should have a USB cable to make downloading to the computer a cinch (check that it is compatible with your teen’s computer too, of course). Check that your teen will be able to film for a minimum of one hour before having to download the footage, and look for zoom and image stabilization features too. If you are buying for a very creative teen with a keen interest in filming and editing, you may want to go for an even more advanced model, possibly a full-size camcorder. Before you make your decision, make sure you check out our video camera for kids reviews, which we’ll be updating regularly to bring you all the new releases and very latest deals!